My thanks to Captain W Lyle Hume for identifying the trawlers in the fourth picture. Granton Harbour is at the centre of Granton, and was the main reason for a community growing up here. 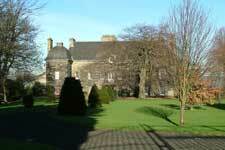 It dates from the 1830s and was newly built in a location where there had not been a harbour previously. At that time, Leith – a couple of miles downstream – was not nearly as fully developed as it became later – only wharves at the sides of the Water of Leith, which was tidal, and the relatively small East and West Old Docks (as they were later known) existed, immediately north of Commercial Street. (They are now filled in.) 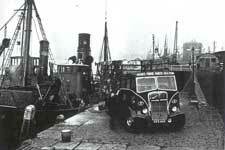 The Chain Pier at Trinity was a light structure suitable only for passnger vessels, not for unloading heavy cargoes. There was a need for a major deep water harbour. 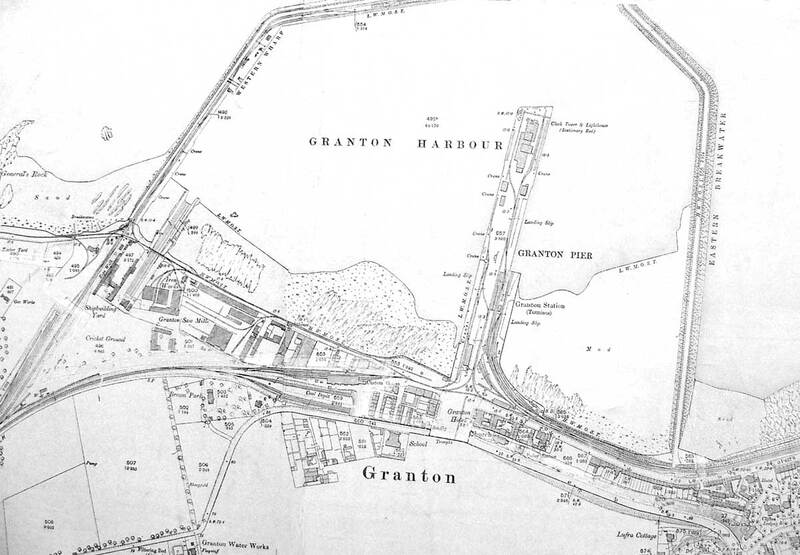 The idea of building a harbour at Granton is said to have been suggested by R W Hamilton, the manager of the General Steam Navigation Company, in 1834. The company ran a fleet of passenger steamers and felt that it would be useful to have a harbour that could be used at all states of the tide. The 5th Duke of Buccleuch , who owned land in the area (and elsewhere), saw the opportunity to build a new harbour on part of the estate he owned, which included Caroline Park House . The Duke was advised about the design of the harbour by Robert Stevenson , better known as a lighthouse engineer. (He was the grandfather of Robert Louis Stevenson , the author). Queen Victoria visited with Prince Albert in 1842, when they made their first State Visit to Scotland, arriving in the Royal Yacht the Royal George. Construction of the harbour continued, firstly with the building of the Western Breakwater, completed in 1851, then the Eastern Breakwater. This was completed in 1863. The stone used for the construction came from the Duke’s own Granton Quarry nearby. Meantime, the Duke and Sir John Gladstone (father of W E Gladstone, the Victorian Prime Minister) had built a new harbour at Burntisland , five miles north of Granton on the other side of the Firth of Forth. 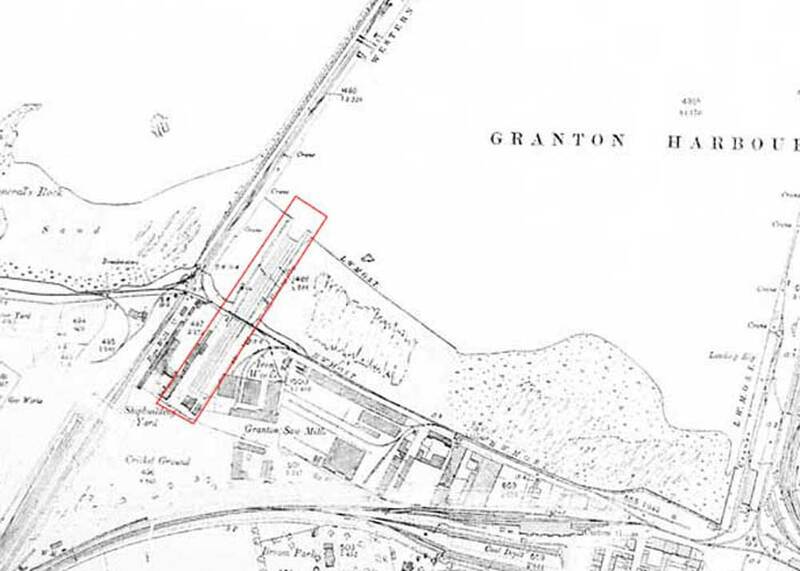 By this time Granton had a rail connection and a roll-on/roll-off train ferry , the first in the world, was established in 1849. This continued to operate until the Forth Bridge was opened in 1890. Granton Harbour is approximately 56 degrees north (of the Equator) and 3 degrees west (of Greenwich). The exact latitude and longitude of the harbour entrance (between the ends of the East and West Breakwaters) are 55:58:50N (55.98066 °), 3:12:36W (-3.20992 °). 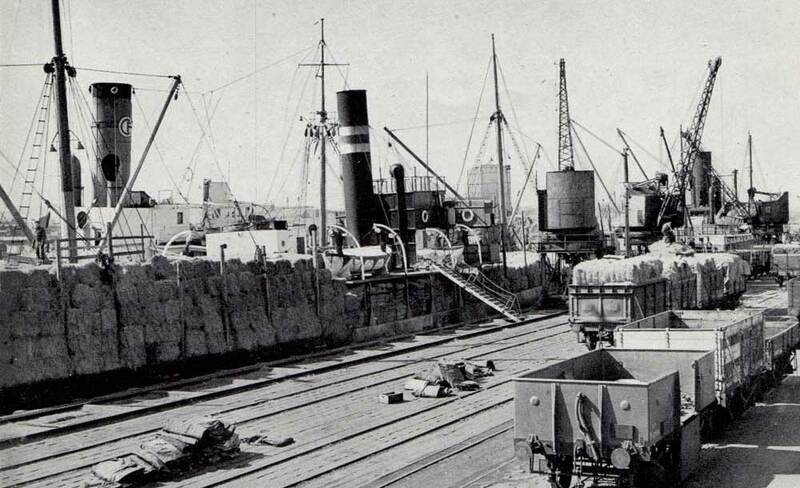 The harbour was equipped with steam cranes, starting in 1860, which allowed heavy cargoes to be loaded and unloaded easily. 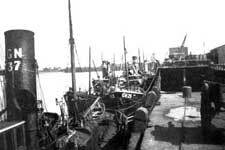 Fishing vessels started using the harbour in the mid 1880s, and the number of trawlers gradually increased to a maximum of about eighty. Fishing vessels registered at Granton carried the registration letters "GN", but many vessels registered at other ports also used the harbour. In World War I, the harbour served as a base for naval vessels, including minesweepers, with a shore base and naval hospital nearby. 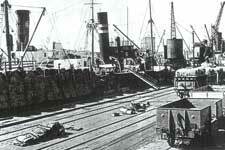 Development continued over the years, with a new coal jetty being built at the end of the Middle Pier in 1937. During World War II, the harbour again was used for naval purposes, and perhaps as a result was the target of an air raid in 1940 when houses at Crewe Place nearby were hit. 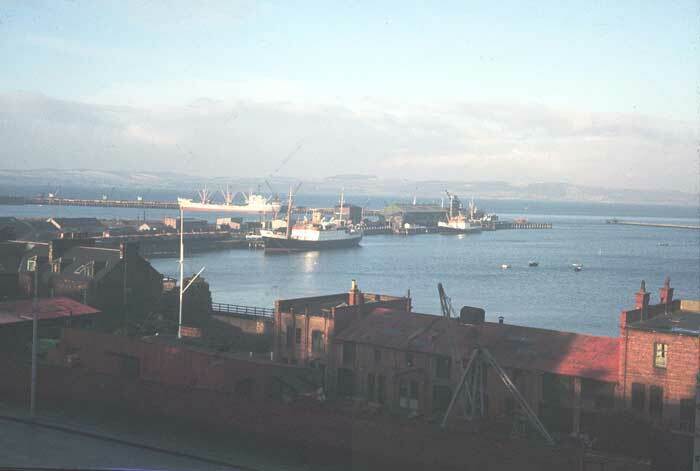 The Harbour passed from the control of successive Dukes of Buccleuch (initially via Buccleuch Estates and since 1932 Granton Harbour Ltd, of which successive Dukes and other family members were Directors). 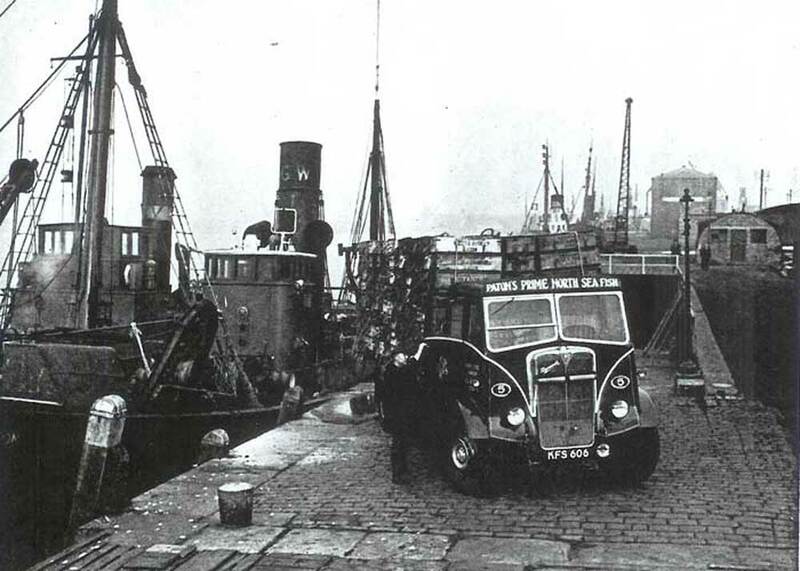 The port was then nationalised and came under the control of the new Forth Ports Authority from 1 January 1968, as did other ports on the Firth of Forth. The Authority subsequently was privatised, becoming Forth Ports plc . In that guise, it has had a major role in the current redevelopment of the Granton area as well as in the dock area in Leith. Much of the Western Harbour has been infilled and has recently been used as the site for new properties . Over the years, Granton has seen a wide variety of cargo vessels, importing timber, esparto grass, petroleum and many other cargoes, and exporting coal (from the earliest days) and manufactured products such as electrical equipment made nearby at Bruce Peebles. 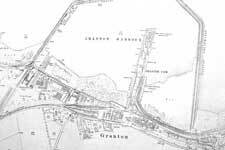 There is much more information in the Granton Harbour Handbook for 1955, published by Granton Harbour Ltd, including a more extensive history, details of the directors, photographs and much other interesting information. You can view either a Flash version, a text version or pdfs (in three parts) of the original booklet. 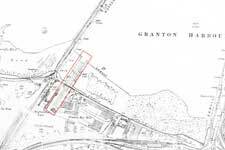 Granton ceased handling commercial traffic in 1974, dredging having been stopped in 1970. 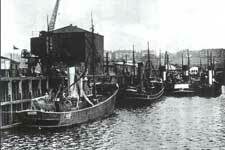 Granton was a major fishing port for many years. This eventually came to an end in 1978. Trawlers at the Middle Pier, Granton (GN37, Drumsheugh, GW26, Rose and A473, Agnes H Wetherley). There is much more information about this on the Granton Trawlers website. Boats were built at Granton, in at least two yards – James Martin’s yard and David Allan’s yard. At the south west corner of the Western Harbour, a Patent Slip was constructed about 1850. This allowed vessels to be floated into a support cradle, which was then then pulled out of the water on a slipway, still containing the vessel, for repairs or other work. This type of slip was devised by Thomas Morton in 1818 and was widely used. The slip extended southwards from the harbour, and the road and later a railway line originally crossed it on a small swing bridge. The map below shows the Patent Slip outlined in red.